Fall is just around the corner, and it is time for school to start again. 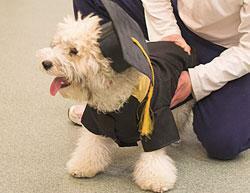 As the kids head off to class, isn’t it time to think about your dog’s education as well? There are many types of classes that you can get your pup involved in, from basic obedience to agility to preparation for formal competition. No matter what your dog’s experience is, chances are there is a class to fit your needs. Enrolling Fido in training can have lots of benefits, too. It’s fun! Most dogs enjoy having a job, and training your dog can become a great hobby! Classes can be an excellent energy outlet for your pooch. Most likely your dog could use and hour or two of dedicated exercise and interaction. Exercise and training can decrease problem behaviors by providing a healthy way for your pup to burn off some energy. Training your dog is a wonderful way to build the bond between you and your pet. And a well-behaved dog is often a much more enjoyable friend. When you are enrolled in a training class, you get the benefit of having an experienced dog trainer getting to know your animal. This better prepares them to help you through specific problems you may be having with your pet. And remember, during the month of September we are running a Boarding Special of 20% off Boarding School Training during the entire month of September. Visit www.finecanine.com for more information.